Engraving from the portrait by J.E. Christie. 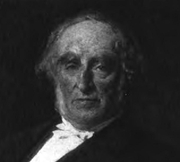 James Legge was born at Huntly, Aberdeenshire, and educated at Aberdeen Grammar School and then Kings College, Aberdeen. After studying at the Highbury Theological College, London, he went in 1839 as a missionary to China, but remained at Malacca three years, in charge of the Anglo-Chinese College there. The College was subsequently moved to Hong Kong, where Legge lived for nearly thirty years. A Chinese Christian, Keuh Agong accompanied Legge when he moved in 1844. He returned home to Huntly, Aberdeenshire, in 1846-7, taking with him three Chinese students. Legge and the students were received by Queen Victoria before his return to Hong Kong.Legge married twice, first to Mary Isabella Morison (1816-1852) and after she died to a widow, Hannah Mary Willetts (d 1881, née Johnstone). Believing in the necessity of missionaries being able to comprehend the ideas and culture of the Chinese, he began in 1841 a translation in many volumes of the Chinese classics, a monumental task executed and completed a few years before his death. During his residence in Hong Kong, he translated Chinese classic literature into English with the help of Wang Tao. He was the headmaster at Ying Wa College in Hong Kong in between 1839 and 1867, and Pastor of the Union Church there from 1844 to 1867.In 1867, Legge returned to Dollar in Clackmannanshire, Scotland, where he invited Wang Tao to join him, and received his LLD from the University of Aberdeen in 1870. While in Scotland, he also revisited his native burgh, Huntly, accompanied by Dr Wang Tao. He then returned to Hong Kong as pastor at Union Church from 1870 to 1873. He took a long trip to North China, beginning April 2, 1873 in Shanghai, arrived at Tianjin by boat, then travelled by mule cart and arrived at Peking on April 16,1873, where he stayed at the London Missionary Society head quarters. He visited the Great Wall, Ming Tombs and the Temple of Heaven, where he felt compelled to take off his shoes with holy awe. He left Peking, accompanied by Joseph Edkins and headed for Shandong Qufu by mule carts to visit Jinan, Taishan, where they ascended the sacred Mount Tai, carried by four men on chairs. Leaving Mount Tai on May 15, they visited Confucius Temple and the Forest of Confucious at Qufu, where he climbed to the top of the Confucius burial mound. James Legge returned to Shanghai by way of the Grand Canal, and returned to England via Japan and the USA in 1873. In 1875 he was named Fellow of Corpus Christi College, Oxford and in 1876 assumed the new Chair of Chinese Language and Literature at Oxford, where he attracted few students to his lectures but worked hard for some 20 years in his study at 3 Keble Terrace, over his translations of the Chinese classics. According to an anonymous contemporary obituary in the Pall Mall Gazette, Legge was in his study every morning at three o'clock, winter and summer, having retired to bed at ten. When he got up in the morning the first thing he did was to make himself a cup of tea over a spirit-lamp. Then he worked away at his translations while all the household slept.In addition to his other work Legge wrote The Life and Teaching of Confucius (1867); The Life and Teaching of Mencius (1875); The Religions of China (1880); and other books on Chinese literature and religion.Legge was given an honorary MA, University of Oxford, and LLD, University of Edinburgh, 1884. Legge died at Oxford in 1897 and is buried in Wolvercote Cemetery. Many of his manuscripts and letters are archived at the School of Oriental and African Studies. James Legge is currently considered a "single author." If one or more works are by a distinct, homonymous authors, go ahead and split the author. James Legge is composed of 11 names. You can examine and separate out names.